Codeine (3methylmorphine) is an opiate medication found in numerous products. Opiate drugs are all developed from the poppy plant, from opium processed from the poppy. This places codeine in the same class of drugs as many very powerful painkillers, such as Vicodin and OxyContin, and illicit drugs such as heroin. Although codeine does have pain-suppressing effects, it is also commonly used as a cough suppressant and as a sleep enhancer. It is often taken in conjunction with other pain medications (e.g., Tylenol 3, which is acetaminophen and codeine), and it is most often available in pill or liquid form. Codeine is a controlled substance. The United States Drug Enforcement Administration (DEA) classifies medications that contain less than 90 mg of codeine as Schedule III, whereas formulations of more than 90 mg of codeine are classified in Schedule II. The difference may seem subtle to many; however, Schedule II controlled substances are the highest level of control for medications that can be obtained with a prescription from a physician, and Schedule III substances have fewer restrictions. In any event, codeine is a potential drug of abuse and individuals who use it on a regular basis for an extended period of time can potentially develop physical dependence on the drug. Codeine can only be legally obtained in the United States with a prescription from a physician. Codeine acts by suppressing the functions of the central nervous system (the brain and spinal cord). This accounts for its medicinal effects as well as its ability to produce very mild euphoria. Codeine has an effect on the areas of the brain stem that are involved in respiration and the coughing reflex, and this accounts for its medicinal use as a cough suppressant. The drug is primarily designed for those over the age of 12 years old; however, the drug is prescribed in thousands of cases for individuals younger than this. Its abuse potential is considered to be relatively low, although there has been a concern about an emerging practice where younger individuals consume large amounts of cough syrups that contain codeine in an effort to achieve the psychoactive effects of the drug. Approximately 917,000 individuals report misusing drugs in this class; it is difficult to ascertain how many of these individuals have misused codeine products. The Substance Abuse and Mental Health Services Administration (SAMHSA) publishes the most reliable reports on prescription drug use and misuse; however, it does not at the current time publish figures on codeine use and abuse in the United States. Instead, the figures for the use and misuse of codeine products are included in a category named “other pain relievers” because of potential confusion that use and misuse of codeine in medications that contain other drugs, such as acetaminophen, may be perceived to refer to the acetaminophen and not the codeine. 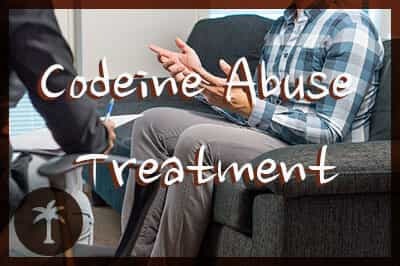 Individuals who abuse codeine will develop tolerance quickly, and this will result in the need to use higher doses of the drug to get the psychoactive effects that were initially achieved at lower doses. 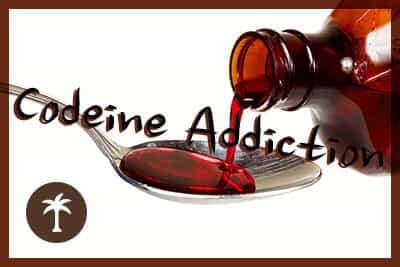 As individuals use larger amounts of codeine products on a more frequent basis, they are more likely to develop issues with abuse and physical dependence on codeine (tolerance and withdrawal). The formal diagnosis for an individual who has abused codeine products would be an opiate use disorder, according to the diagnostic criteria published by the American Psychiatric Association (APA). This diagnostic label encompasses both the older notions of substance abuse and substance dependence. Some of the signs of an opiate use disorder as a result of codeine abuse are outlined below. The person displays a pattern of maladaptive use of codeine. Use of the drug is for nonmedicinal reasons and results in significant distress or impairment in life. The individual often experience significant cravings for codeine. The person develops tolerance to codeine. The person develops withdrawal symptoms when they stop using codeine or cut down their dose. Ready to leave codeine addiction behind? Most individuals are not qualified to make a formal diagnosis of an opiate use disorder. Only trained mental health clinicians can make this diagnosis. In addition, many individuals who are friends, relatives, or coworkers of an individual with a potential opiate use disorder are not able to ascertain whether many of the formal diagnostic criteria are actually satisfied due to their inexperience or limited access to understanding the behavior patterns of the individual. Some other signs that may suggest an individual is abusing codeine are outlined below. The individual frequently uses codeine products but does not have a prescription for them. The person appears lethargic or extremely sleepy frequently during the day. The person may appear to be intoxicated, such as displaying slurred speech, staggered walk, slowed reflexes, etc., without the smell of alcohol. Numerous prescription containers for codeine or empty containers of cough syrup are found in an individual’s room or on their person. The individual displays an increase in dishonest behaviors, such as lying, stealing, etc. The person displays uncharacteristic neglect of personal hygiene or uncharacteristic sloppiness. Frequent flulike symptoms occur in the individual, such as headaches, nausea, lethargy, etc. A change in the individual’s social contacts occurs, such that the person begins to associate with individuals who are known drug users. Signs of frequent isolation (e.g., missing for significant periods of time without explanation) are present. Financial difficulties that seem uncharacteristic for the person begin to occur. The person experiences numerous accidents that seem uncharacteristic for them. The individual displays personality changes that include increased irritability, being oversensitive, being isolated, etc., that alternate with periods of happiness or sociability. Individuals with a prescription for codeine use it in manners inconsistent with its prescribed instructions, such as using it with alcohol or other drugs, or taking it more frequently or in greater amounts than the prescription requires. Experiencing withdrawal symptoms represents the second phase of the development of physical dependence on any substance. Individuals initially develop significant tolerance to the substance (requiring higher doses of a drug to achieve the effects that were once achieved at lower doses), and then, as the individual’s system adjusts to the presence of certain drugs, when the levels of these drugs decline significantly, the individual will experience withdrawal symptoms. The development of physical dependence on codeine is not uncommon, but the symptoms of withdrawal are not generally considered to be potentially dangerous like the withdrawal syndrome that occurs as a result of discontinuation of alcohol in individuals with histories of moderate to heavy alcohol abuse. It should be noted that whenever an individual experiences emotional distress, alterations of judgment, and physical symptoms that can lead to feelings of desperation, there is always a potential danger of relapse and overdose, accidents, or even self-harm. Chronic users of narcotic medications often present with withdrawal symptoms that are very physically uncomfortable and include issues with mood, such as increases in anxiety and depression. Thus, anyone discontinuing any controlled substance should only do so under the supervision of a physician. The withdrawal syndrome associated with discontinuing codeine can be quite variable in its presentation from person to person, but the general timeline is outlined below. Symptoms appear an average of 12 hours following discontinuation of the drug. The range of the appearance of the initial withdrawal symptoms can be quite variable. It can occur in individuals who are heavy users only a few hours after discontinuing the drug. For others, it may take up to several days after discontinuation for symptoms to appear. The appearance of withdrawal symptoms is often related to the level of tolerance for the drug the individual has developed, and this is often related to the typical amount of the drug the individual abused and the time period over which the individual has been using the drug. Withdrawal symptoms from codeine typically represent flulike symptoms, such as jitteriness, headache, muscle aches, nausea, irritability, insomnia, appetite loss, and other feelings of general malaise. Cravings will inevitably begin once the individual experiences the onset of withdrawal symptoms. The symptoms typically peak within 3-5 days following stopping use of the drug. Following this peak, they will decline in intensity, and many individuals may be able to continue their normal routine once they experience the peak of the symptoms. Continued feelings of anxiety, general malaise, and cravings for the drug may continue. 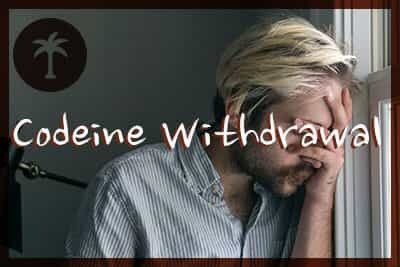 The majority of individuals who withdraw from codeine experience a resolution of the withdrawal symptoms within seven days after discontinuing the drug, although intermittent feelings of lethargy, anxiety, irritability, cravings, etc., may continue. Cravings should decline in intensity over time, but the individual may continue to experience intermittent cravings that are triggered by reminders of their drug use or stress. Many sources still continue to refer to a prolonged period of withdrawal that can last for weeks, months, or even years following discontinuation of a drug. The symptoms associated with this post-acute withdrawal syndrome or protracted withdrawal syndrome are often listed as psychological type symptoms that include depression, problems with motivation, and continued cravings. Research studies have never been able to empirically validate these symptoms as related to any type of formal withdrawal process, and they most likely represent other psychological and emotional issues. Treatment for withdrawal from codeine typically involves the use of opioid replacement medications or other medications to address specific symptoms. The use of opioid replacement medications, such as Suboxone, can eliminate or substantially reduce the severity of the withdrawal symptoms. Once an initial dose of the medication is established, the physician then slowly tapers down the medication at specific intervals over time to wean the person off the drug. This strategy results in an individual not experiencing any significant withdrawal symptoms, but it often extends the overall withdrawal period. It has been long established that simply going through the withdrawal process from any drug does not constitute a program of recovery. Getting through the withdrawal process prepares an individual to enter a program of recovery, and individuals who do not get involved in a comprehensive treatment and aftercare program will inevitably relapse. Even individuals who are involved in formal substance use disorder treatment programs suffer relapses at significantly high rates, but these individuals are prepared to deal with relapse and have a greater probability of success over the long-term than individuals who did not get involved in these programs. Ongoing participation in 12-Step groups, specialized peer support groups, online support groups, etc. Recovery programs should follow a general overall outline that is individualized for the specific needs of the person in recovery. Some individuals might need additional assistance or therapies, depending on their situation. Success in recovery is strongly related to the amount of time an individual continues their participation in treatment-related activities, such as therapy, social support group participation, volunteer work, etc. Research suggests that individuals who spend a minimum of 5-7 years actively participating in treatment and maintaining abstinence from drugs and/or alcohol have the best prognosis.